Surrounded by the Carpathian Mountains and the forests of Transylvania, Brasov makes a great base for exploring Romania’s untamed wilderness. From alpine hiking and skiing to close encounters with brown bears, here’s how you can enjoy some of Eastern Europe’s most spectacular outdoor activities. Hikers of all abilities will find trails to wander in Piatra Craiului National Park, set in the crags and valleys of the Carpathians. Trek through Zarnesti Gorge and get a glimpse of Romanian country life while passing traditional alpine villages. Bucegi Natural Park offers trails that run between sheer cliff drops and rock formations, while a short loop at Piatra Mare Mountain leads to the narrow Seven Ladders Canyon, where you can scale waterfalls and cliffs using ladders and bridges. The Fagaras range of the Carpathians, with glacier lakes and panoramic views reachable by the Transfagarasan Highway, is also close enough for a day trip. Brasov is in the heart of Romania’s brown bear country—one of the last wild bear habitats in Europe. Venture deep into the Transylvanian forests with a ranger guide to observe some of these creatures roaming in the wild, plus other wildlife such as lynx, deer, and wild boar. Most tours are limited to a small group to avoid disturbing the bears, and some boast an 80 percent chance of bear sightings. Escape modern civilization and reach remote, unspoiled sections of the central Romanian wilderness on a 4x4 day trip. Go off-roading through Transylvanian forests, Carpathian mountain roads, and Old World villages that seem untouched by time. Both half-day and full-day 4x4 tours are available from Brasov. Trek high into the Carpathian Mountains on a guided day hike from Brasov. 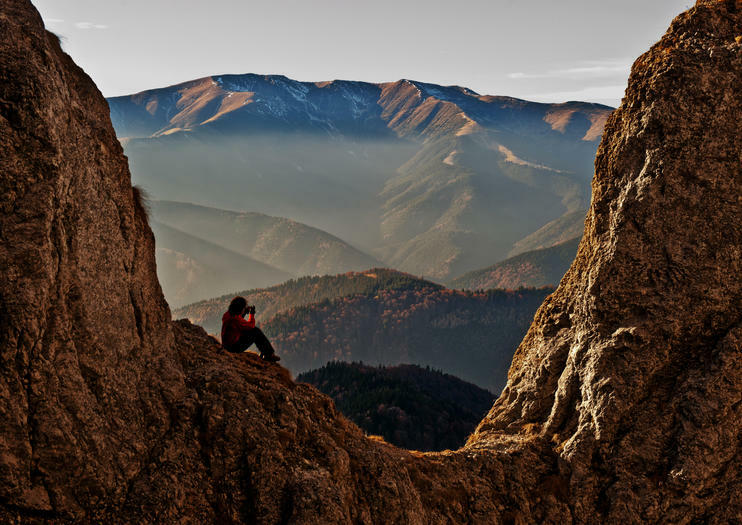 Join a group hike among some of Romania's most spectacular scenery in Piatra Craiului National Park, or opt for a private tour to your choice of four other top outdoor destinations including Bucegi Natural Park, the Fagaras Mountains, and the ‘7 Ladders’ canyon of Piatra Mare. The itinerary is customized based on your experience level and preferences and can range from a moderate 5-hour route to a strenuous 10-hour challenge. The Carpathian Mountains offer unique hiking and sightseeing opportunities, but knowing the best trails can be difficult alone. Discover the rural landscape on a hiking tour of the Piatra Craiului from Braşov, via the Libearty Bear Sanctuary, and keep up your energy with a picnic lunch included. Travel the region with ease, with round-trip transfer from your Braşov hotel. Transylvania’s landscape offers prime hiking opportunities, but can be difficult to navigate alone. Enjoy a break from the city on a hiking tour of the region from Brașov, with a range of options available for all ability levels. Discover the region’s mountainous terrain as well as its flora and fauna, with insights provided by your guide, and relax after an active trek with round-trip transport from your Brașov accommodation.